Clash Royale combines card battle with tower defense elements. It features your favorite characters from the Clash of Clans universe. A pure competitive RTS, the game pits you against randomly chosen human opponents in live multiplayer battles that take place in bite-sized arenas. The goal is to destroy opponent’s crown towers and the player who destroys the most number of towers is declared the winner of an arena battle. Such is the popularity of this game, that there have been several games that boast similar gameplay. As you play more arena battles, you will collect cards that can be added to your battle deck. You can have a maximum of 8 cards in your battle deck. Cards can be upgraded by collecting duplicate cards. 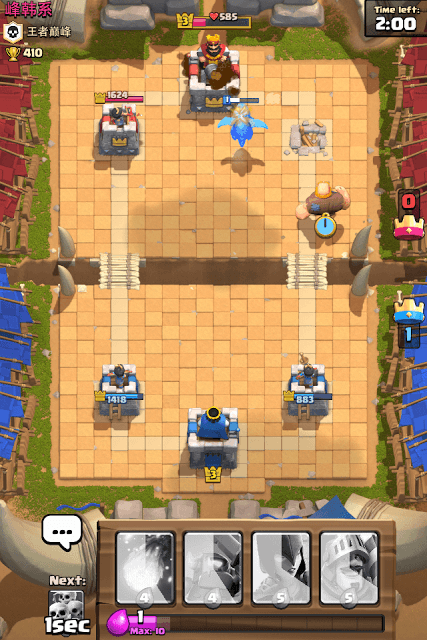 Towers can also be upgraded by reaching a new “King Level”. You receive chests and trophies as rewards after winning a battle. If you have just started playing, then these beginner-level tips, hints and strategies will help you choose the right deck and win battles. Deploy units to destroy your opponent’s arena and King Towers. Some units are slow-moving, such as the Giant, so make sure you drag such cards at the edge of the red border. The red part is the area that can’t be accessed. When the game begins, quickly place your best unit, especially the slower moving ones, close to the border of the red area if you want them to reach their target faster. After destroying your enemy’s arena tower, you occupy a part of enemy’s territory. You will see that 25 percent of the red area removed. You can now deploy your units directly on enemy territory, which will help them reach the King’s tower much faster than before. And if the timer is less than 60 seconds, then just keep deploying fast and medium paced troops, or groups such as the skeleton army on the unlocked enemy territory. If you destroy the second arena tower, 50 percent of the red area will be removed, making it much easier for you to deploy units on enemy arena for faster destruction of towers. Once you have destroyed either of the two arena towers, you can deploy your troops on enemy territory. But make sure you place your units on the path, as shown in the above screenshot, if your next target is the King’s tower. 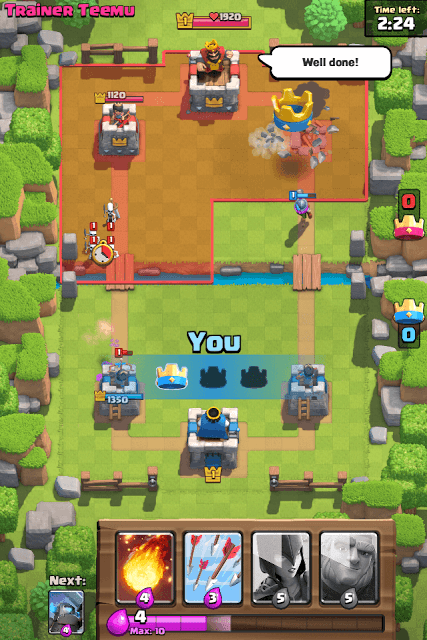 Troops, such as the Giant, can lose their way and target the next arena tower instead of the King’s tower if not placed on the path. While upgrading cards can improve their stats, leveling-up can improve your tower defenses. 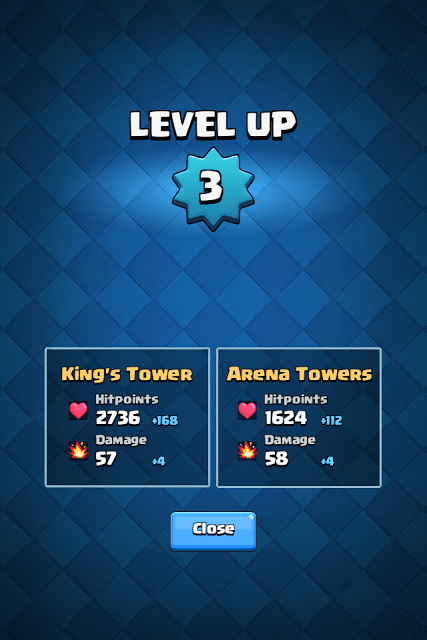 Once a player reaches a new “King Level”, all towers get a stats boost. Their HP and damage increase by some points. A player’s King Level is displayed at the bottom-right corner of the game screen. To level-up, you will need experience, which can be earned by upgrading your cards and by donating cards to your clan members. You will have to join a clan to donate cards to its members. Donate a card when someone requests it, but just make sure you don’t donate those that you think are crucial for battle or are required to complete upgrade. Donate the spare ones or those cards that belong to a card not on your battle deck. Upgrade all cards, even if they aren’t part of your Battle Deck. Remember that every upgrade will add some experience points to the King level. Upgrades require coins, which can be acquired from free, crown, silver and golden chests. Have a balanced deck comprising of units that can deal damage to ground, air and ground, and buildings. Also make sure that you add fast-moving troops such as the skeleton army and goblins to your deck. They can be extremely useful, especially when deployed in large numbers. The skeleton army can really come handy if they are being deployed along with a stronger melee character, such as the giant. Have at least 2 spell cards because they can deal some serious area damage and can come really handy if you want to launch a direct attack on an enemy tower. You just need to drag and drop a spell card to a tower that you want to destroy. Use it when a tower is partially destroyed and has a few HP to go before it crumbles into pieces. Spell cards have stats like “Area Damage”, “Tower Damage” and Radius. Tap a card and then tap on the blue “Info” button to know more about your cards. A troop card displays several stats such as Hitpoints, DPS or Damage per second, Damage, Hit Speed, Tangents, Speed, Range and Deploy Time. You will have to check these stats and then make a decision as to whether you will add it to your battle deck or not. You can build three different decks with the cards that you have collected so far. Try experimenting with each deck by using it in battles and use the deck that wins the most battles. 4. When Should You Request Cards from Clan Members? 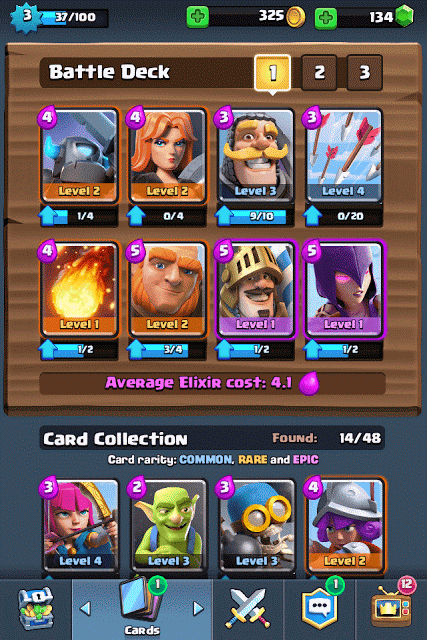 A troop or spell card requires a certain number of duplicate cards to get upgraded. Once the required number is met, use coins to complete the upgrade procedure. You can get these duplicate cards via chests. Many times, you might not get the required card because the cards that you receive from chests are chosen randomly. Once you join a clan, you have will have the option to get a card of your choice. Request a card when there’s only one of two cards remaining for the upgrade process. Remember that not everyone will donate card, especially if the duplicate card belongs to a rare card, but there’s no harm in asking for some, as it won’t cost anything. You can donate some of your cards that you don’t require to gain experience points. Donate extra cards to other players in your clan and do not donate those that play a key role in battle. While attack is the best defense in Clash Royale because of the time limit, you should seriously consider defending your towers by placing your troops in front of the approaching enemy army, especially if the enemy has deployed powerful troops. The enemy will use a combination of spell and troop cards and while your towers will be able to defend themselves against troops, placing your troops between your attacked tower and the enemy army can minimize the damage to some extent. Once enemy troops are destroyed, your troops will march to their target tower. You can also use spell cards such as the Fireball to destroy troops that arrive in large numbers, such as the skeleton army or goblins. Because of its high HP (2200 Hitpoints!) it will take more than one troop to defeat him, plus the enemy giant won’t attack him as Giants target only buildings. The card requires 5 elixirs to deploy. Giant inflicts moderate damage, but can be very useful in destroying arena towers. If the game has drawn a Giant card for you, use it immediately. This unit inflicts more damage and has an excellent DPS, plus it moves pretty fast. Use it carefully and have support troops following him. You can use the skeleton army or ranged troops like archers or the witch to support this melee unit. There are different types of chests such as Free chest, Crown Chest, Silver and Golden chest. Free and crown chests are available in every few hours. When crown chest is opened, the crowns you have collected will fill the crown meter. Win or lose, every crown will be added to the crown chest and once it fills up, you will be able to unlock it. Silver and Golden chests need some time to be unlocked, so make sure you tap on a chest and press the “Start Unlock” button to begin the unlocking procedure. If you have a golden chest, then try to unlock it first. No you cannot unlock another chest when you have already selected one. The game is time based and both players have to destroy each other’s towers before the timer runs out. The player who destroys the maximum tower is declared the winner. When the timer hits 1:00, each player’s elixir bar fills up faster. You can deploy more troops, and if you have already destroyed an arena tower, then quickly place units on the unlocked part of the enemy territory. Elixir is produced every 2.8 seconds. When 60 seconds remain, the production time decreases to 1.4 seconds. You can choose units of your choice. I usually place a slow-paced melee unit such as the Giant followed by ranged units to support him. In between you can deploy fast-paced units such as spear goblins and melee goblins or the skeleton army. Goblins require only 2 elixirs and so you can deploy more such units when there are only 60 seconds remaining. To unlock an arena in Clash Royale, you will have to earn a certain number of trophies before you can unlock an arena. For example, if you want to unlock the Bone Pit, you will have to earn 400 plus trophies. Winning a match will earn you trophies, but you may also lose some if you lose it. Keep playing, winning and earning trophies to unlock new arenas. If you win against an opponent who has more trophies than you, you will receive more trophies than you normally would. And if you lose, you will lose fewer trophies. You will usually face opponents whose levels are twice above or below you.